The perfect introduction to LOGO. Camboard LOGO is a flexible logo graphics program that introduces children to one of the most popular computer programming languages. 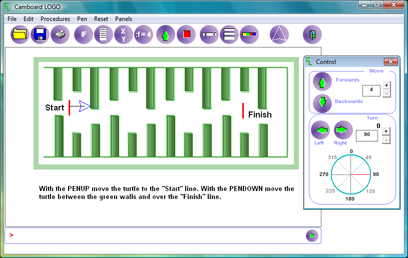 At its simplest level the program provides control of the turtle vector by simply clicking on icons, this introduces directions, distances and angles with optionally leaving a trail around the screen. 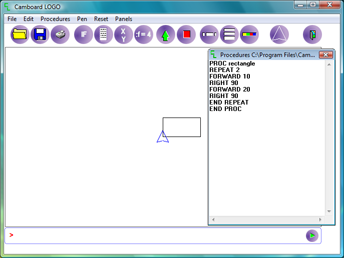 Commands can be entered that introduce simple programming, children can use simple commands like FORWARD 10, RIGHT 90 or PENUP commands can be built up into procedures that are used over again to produce repeat patterns. Graphical drawings produced can be printed. Pictures can be loaded for the turtle vector to draw over. Includes activity screens and online user guide and tutorial.